Since 2015, Scholarship America has hosted an annual salute to student success and those who make it possible. On May 22, 2018, we’re celebrating our biggest Dreams to Success event yet: a whole day of inspiration, education and celebration centered on students and their champions. Registration remains open through the end of this week. If you’re thinking of joining us in Washington later this month, here’s what’s in store. To kick off the day, Scholarship America is convening its first-ever Partner Summit: a gathering of scholarship sponsors, administrators, students and policy experts who will spend the day discussing the past, present and future of student-centered education assistance. We are also proud to feature a conversation between John B. King Jr., former U.S. Secretary of Education and President and CEO of The Education Trust, and Dr. Martha Kanter, former U.S. Under Secretary of Education and Executive Director of College Promise. These two lifelong education-policy experts will discuss the current state of higher education funding, and explore how we can all do better for currently underserved students. The Partner Summit also boasts presentations on student success programs from AXA, College Possible, Genentech and Travelers, as well as a roundtable discussion with students from BridgeEDU—ensuring attendees hear firsthand just what works for learners in the real world. After the Partner Summit, it’s time to transition to our annual flagship event: The Dreams to Success National Education Dinner & Awards Celebration. The dinner is a chance to shine a spotlight on both students and education supporters, and we couldn’t be prouder to be presenting the 2018 Scholarship America Honors to three individuals and organizations that go above and beyond to ensure college and technical school success. Senator George J. Mitchell: The George J. Mitchell Scholarship Institute has awarded more than 2,500 scholarships totaling over $14,500,000 to a graduating student from each of Maine’s 130 public high schools. Recipients receive more than a check: the Mitchell Institute also offers a wide array of personal, academic and professional support programs. Genentech: Futurelab is Genentech’s STEM education initiative that supports all K-12 students in the South San Francisco Unified School District and gets them excited to learn about science, improves their college readiness and inspires them to pursue careers in STEM fields. Futurelab Scholarships motivate these students to dream big, and include four-year awards of $50,000 per year to two exceptional seniors each year. GE Foundation: Through its signature education and skills initiatives – Developing Futures™ and Developing Skills™ – the GE Foundation seeks to empower 14-24-year-old students by providing access to learning experiences necessary for the workforce of tomorrow. In addition, the GE-Reagan Foundation Scholarship Program and new GE-JFK Library Scholarship Program reward college-bound students who demonstrate exemplary leadership, drive, integrity, and citizenship. 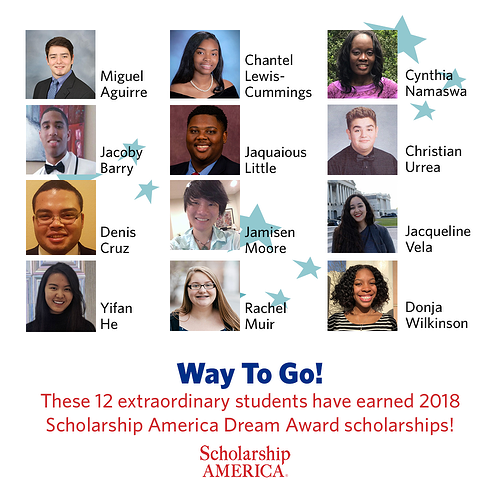 The Dreams to Success National Education Dinner & Awards Celebration also gives us a unique opportunity to salute the 2017 and 2018 Scholarship America Dream Award scholarship recipients. This scholarship supports students who have started their college careers but face obstacles that threaten to keep them from finishing. The 2017 class of recipients is a remarkable group of ten students; you can read all of their stories elsewhere on this blog, and we’ll hear directly from 2017 recipient Yessenia Cantero Hernandez during the Dreams to Success dinner. In addition, the 2018 class of recipients — pictured above — will make their first public appearance at the celebration. All 22 of these incredible students will be attending the opening reception and seated throughout the room during the dinner, giving attendees a chance to learn their amazing stories directly over the course of the evening. Finally, to ensure a truly celebratory atmosphere, we welcome host Jearlyn Steele and musical guests The MusicianShip Washington Youth Choir. A member of the acclaimed family group The Steeles, Jearlyn Steele is a renowned entertainer, keynote speaker and radio host; the MusicianShip is an elite performance ensemble that uses music to help D.C.-area youth achieve their goals. Their performances are sure to be unforgettable, so don’t miss out. 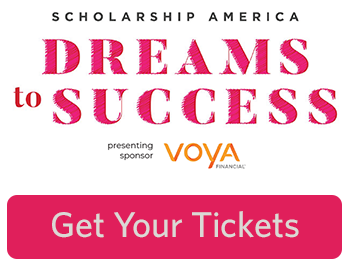 We can’t wait to see you in D.C. for our biggest Dreams to Success event ever!